The Jerusalem artichoke, again one of those products you hardly ever use. 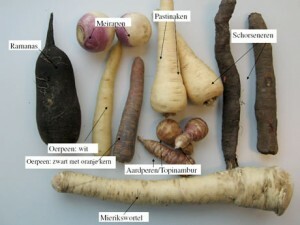 In Dutch they’re called aardpeer (earth pear) or topinambour and are one of what we call “forgotten vegetables” These are veggies like salsify, parsnip, turnip and horseradish. Produce that is not normally sold in regular supermarkets and thus “forgotten” by everyone but your grandma. To be honest I use some of these regularly but not the Jerusalem artichoke, as I didn’t know much about them I looked them up on the Wikipedia page. Apart from now knowing it’s a Native American species of sunflower my eye was drawn towards a quote by English botanist John Goodyer. This is the first one I had a little difficulty with because it involves tempering but i’ll get to that later. This is a recipe for four and you will need. First peel the artichokes, wash them and cut them up in to 2 cm cubes. Now boil them in the stock with the chopped garlic, rocket and a pinch of salt. They should take about 20 minutes to boil, mine were a little soft when done so maybe 2 or 3 minutes less next time. While they are boiling cut up the spring onions in to small parts and set aside for later. Whisk the egg and the yoghurt together in a large bowl, make sure it is large enough as you will be adding soup to this as well. Now for the tempering, basically adding heat to the yoghurt so your soup doesn’t curdle. This is, as the book says, not as hard as it seems. 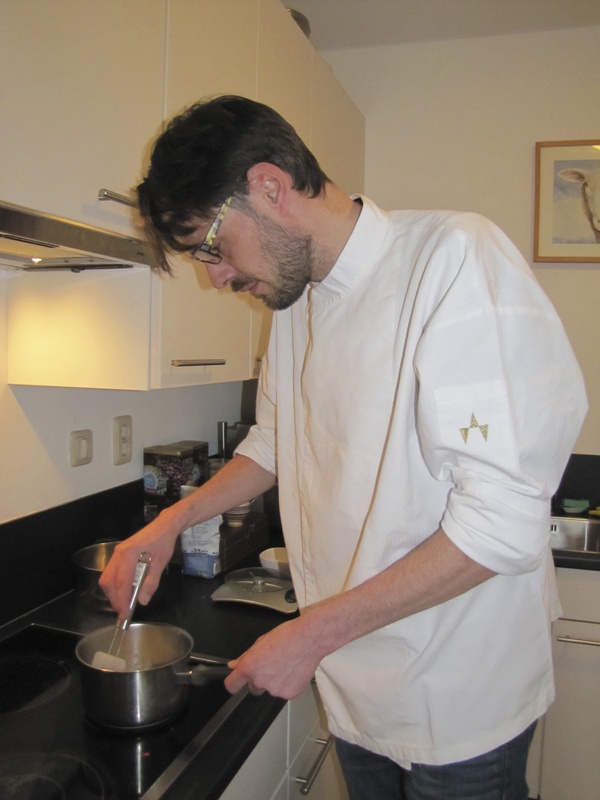 Bring the soup to a boil, add a ladle of soup to the yogurt and give it a good stir. Keep doing this till you’ve mixed in half of the stock and the yoghurt feels warm. Still no problems up till now! Next you add the yoghurt mixture to the rest of the soup and keep stirring while you do, gradually heat till it’s not quite boiling. This is where it kept going wrong, I literally followed the instructions to the letter, twice, and both times it curdled a little right at the end 😦 The second time my girlfriend and I did it together, it was a perfect soup up till the last second. What is going wrong? Any tips? Anyway, to finish off add the spring onion and salt and pepper if needed. 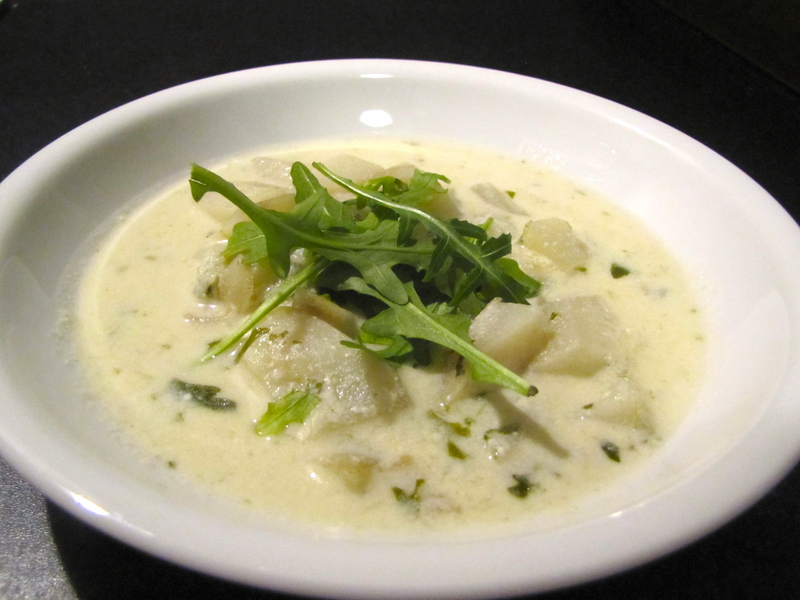 Serve the soup and garnish with the rocket salad and you’ve got a great starter. It still looked and tasted good as well, not peculiar at all and the rocket gives it a nice peppery taste. 5 down, 135 to go. This truely was a great soup. Now I know where the loathsome stinking winds came from!